The Invacare Rea Dahlia is a tilt-in-space chair that provides comfortable seating and enhanced postural support. With a tilt in space angle of 0 – 45 degrees. This wheelchair is based on a single frame that can accommodate the different rear wheel sizes and castor sizes in different settings making it suitable for passive or moderately active users. The weight shifting function (Centre of gravity) offers excellent stability during use and the specially designed Invacare Flex3 seating system provides adjustment in both seat width and depth. The floor to seat height can be adjusted from 13” to 20”. This chair is available in either self propelled or transit versions. 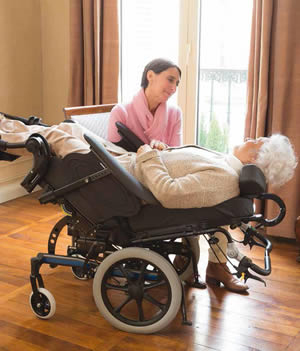 This wheelchair can be adjusted to suit any user and is very easy to use and is therefore ideal for nursing homes. It has a narrower frame than the Rea Azalea making it ideal for use in confined spaces and easy to manoeuvre through narrow doorways. If you have any questions regarding the Rea Dahlia or would like to book an appointment to be assessed please do not hesitate to contact us on 0330 0581 008 (Local call rates apply) or FREE PHONE 0800 626 829 or complete the form on this page and we will get back to you.